OPI Suzi Says Da! and Pure Ice Meet Me In Monaco, Get ready for Decembers posts! I've got a few gems coming up that I think you're really going to like. For those of you who know me personally, you know that I have been doing some serious hauling of nail polish in the last couple of months So much so that I had to put MYSELF on restriction and made a vow not to buy another single bottle of polish until the New Year. That's not that long, but during the holiday season with all the sales going on...that's a big deal for this nail polish addict. Anywho! 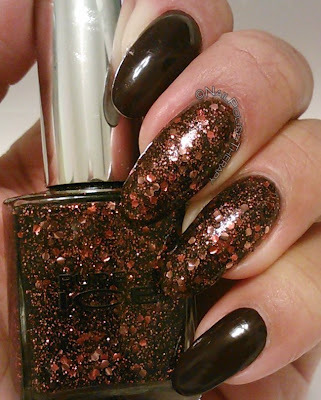 For the rest of the month you will see posts on some of the new polishes I've acquired and I hope you enjoy them as much as I have. 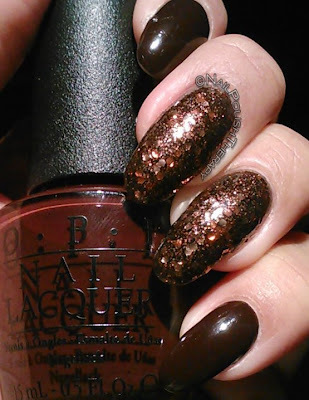 First up is OPI Suzi Says Da! (old) and Pure Ice Meet Me in Monaco (new). I was disappointed in Suzi Says Da! because it's so dark it looks black in most lighting but should be a dark chocolate. Pure Ice Meet Me in Monaco was great though. I scored with this one and only $1.99 at my local Walmart. 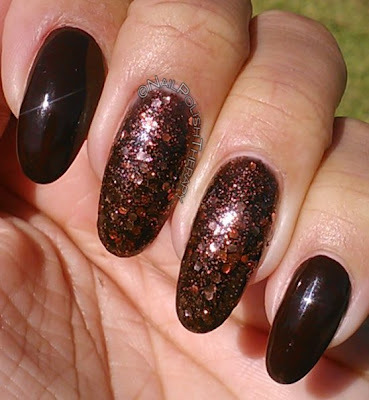 It has multi sized cooper glitter in a black jelly, and is easily opaque in 2 coats. The glitter was not too chunky and spread evenly with ease. Thoughts? Feelings? Concerns?